“He was an ardent Free Trader, and the Anti Corn-Law league had in him and indefatigable worker. He was Secretary of the British Branch of the League and in this capacity, he was brought into contact with many of the Free-Trade reformers of the period – Mr Cobden, Mr Bright and Colonel Perronet Thompson”. This is not the obituary that you would expect for a man whose life is usually thought to be focused on printing and the production of the Bradford Observer from its start in 1834 until his death in 1891. A more expected obituary was to be found in the Sheffield Independent newspaper where Byles was compared with two other giants of journalism; Sir Edwin Baines of Leeds and Alderman Leader of Sheffield. Byles was the last of the three and brought about what the Sheffield Independent believed to be the end of an era dominated by the three. William Byles was born on 19 July 1807 in Henley on Thames, to John Curtis Byles, a ship’s chandler and his wife Bridget. He was the fourth son and grew up in a relatively poor family. By his own admission he had to leave school aged 13 years old and did not get the benefit of a good education. Instead, he went into a printing shop where, in his owns words “learnt the trade and learnt it well”. His talent as a printer and equally importantly, his Congregationalist upbringing made him an attractive candidate as the first manager of the Bradford Observer. Dr Benjamin Godwin, a Baptist minister and anti-slavery campaigner was part of a group of leading Non-conformist townspeople in Bradford who wanted to start a newspaper to promote the Liberal cause within the town. The group consisted of 86 shareholders that included the likes of Robert Milligan, Daniel and Titus Salt, Henry Forbes, Edward and Henry Ripley, James Cosens, Thomas Aked and Christopher Waud. 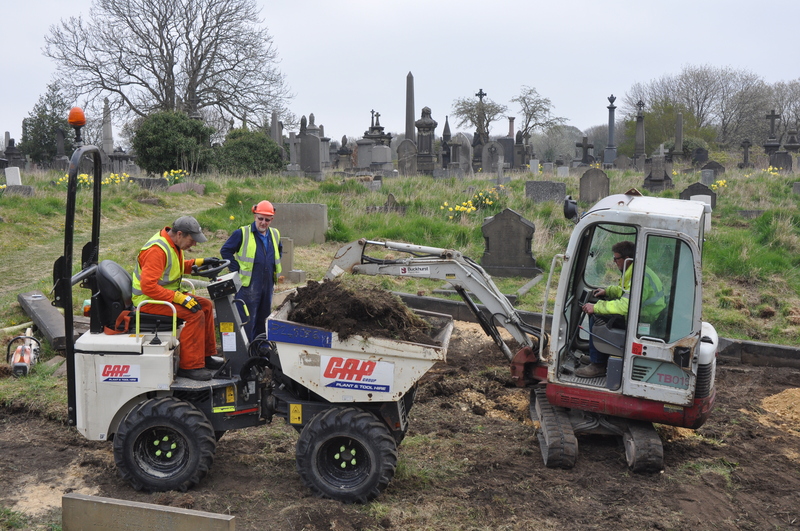 The Group consisted mainly of local businessmen and manufacturers. Although Byles hesitated in accepting the post, mainly due to his lack of knowledge about journalism, he was eventually persuaded and arrived in Bradford in December 1833. Amazingly, the first publication of the of the newspaper was on February 6th, 1834. This was not the first newspaper to be published in Bradford. In 1825 Dr John Simpson, a physician published a newspaper; The Bradford Courier and West Riding Gazette. The launch was financed by Simpson, Thomas Inkersley, Joshua Mann, John Rand, Mr Leacock and Mr Armistead who each gave £200. However, at this time publishing was suppressed by heavy taxation. This included; 4pence per paper and 3 shillings and six pence for each advertisement. Over the next thirty-five years these taxes were reduced, however, the new Bradford Observer was also obliged to pay them. It also suffered from a small circulation. William Scruton, when writing about Bradford’s reading habits did note that the working man could not afford the usual 7 pence to buy a newspaper and therefore “clubbing up” was practiced, whereby several families clubbed together to buy one newspaper to share. Of course, much of the working classes could not read. The poor circulation did mean that the capital needed was small and The Bradford Observer only needed between capital £1000-£2000 and six men and two boys to operate in 1834. 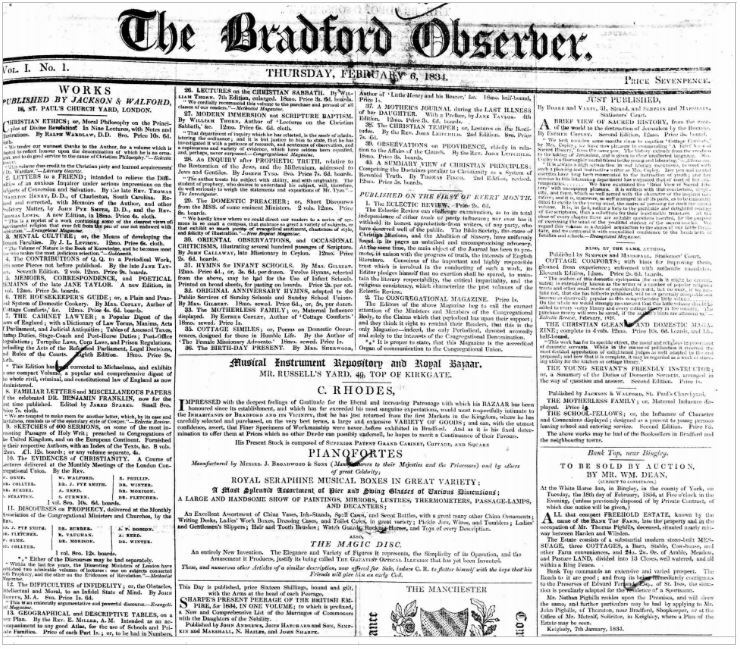 The Bradford Courier closed in 1828. The Bradford Chronicle that also started in 1825, lasted but a few months. The Bradford Observer still had a competitor in the Leeds Mercury that was well established and circulated in Bradford. There were also problems associated with the actual printing of the newspaper. Printing presses fell to pieces resulting in rival printers having to be employed to get the paper printed and distributed. When a procession of printers was seen at night carrying the news print up Kirkgate, it was stopped by the Watch because there had been reports that they were in fact of group of body snatchers! The leading journalists were sacked one after another and between 1834 and 1841, Byles had to assume the position not only of manager but also editor, sub-editor, publisher, reader of proofs, book-keeper and printer. The paper steadily lost money and in 1838 briefly closed. However, Milligan and Forbes believed in both Byles and the paper. They loaned Byles money to continue and with profits from Byles recently acquired printing business he had purchased from Edward Keighley, Byles became financially independent. However, the paper continued to lose money and in 1841, Milligan and Forbes brought in John Dale as manager while Byles concentrated on editing the paper. This was disastrous and Byles described Dale as “ totally ignorant of the situation, though a very nice gentleman”. Dale left the paper within twelve month and Milligan and Forbes again turned to Byles. The offer they made him was extremely generous. The offer was that Milligan and Forbes would loan funds sufficient to get the newspaper going once more. If the venture succeeded the newspaper would become Byles’ property and the money repaid. If it failed, Milligan and Forbes would write off the debt. Byles accepted the offer and from 1842 until 1868, the newspaper thrived. Although, there was to be sadness in his private life. William Byles married Anna Holden in 1837 and children followed; Mary, William Pollard, Alfred Holden, and Henry. Sadly, Anna died in 1845. In 1848, he remarried. His new wife was Jane Drewatt Brangam of Oxfordshire. Together they had further children, Anna, Harriet, Frederick Glyde, Ellen Margaret, Edith Jane, and Mary Anna. Byles spent most of their time in Bradford living in the Ashfield area of Great Horton. In 1858 a competing newspaper; the Bradford Review was started by a group of militant dissenters dissatisfied with the middle of the road Liberalism practised by and promoted by Byles. Among the Review’s backers were Robert and S C Kell and Alfred Illingworth. They were representatives of the newer, more abrasive Liberalism with whom Byles was to clash most bitterly in the 1870’s. The Review was edited by James Hanson, more famous for efforts in education and the promotion of library services. The paper was more successful in attracting the working classes than the Observer that received the support of the Non-conformist businessmen and professionals. The appearance of a daily Liberal newspaper was thought to demonstrate a real split Bradford Liberalism. Dr Wright summed this up division between the two generations as, “ For them the radicals of an earlier generation seemed now to be almost conservatives”. Byles’ Observer managed to survive the introduction of other newspapers, including the Liberal Bradford Daily Telegraph, the Conservative Bradford Chronicle and independent Bradford evening Mail. In 1868, Byles converted the Observer into a daily. He also published the weekly, Observer Budget and the Keighley News. In 1874, Byles offered some support to W.E. 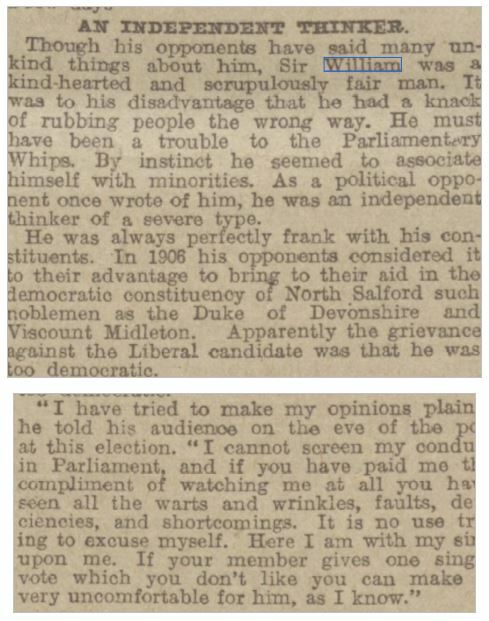 Forster in the election of that year which caused more mistrust between himself and the more radical Illingworth and subsequently more difficulties for the newspaper. As stated in his obituary, Byles was shaped by more than journalism. Like many Non-conformists, his life and character were shaped by his beliefs and the conflict between the Non-conformist Church and the Church of England. There were fundamental differences between the two belief systems and the Non-conformists, that included the Congregationalists, Baptists and all shades of Methodism, could neither forgive nor forget their persecution during the previous two centuries. Those who refused to take the sacrament in the Anglican Church, were broadly excluded from positions in Government, the Professions and often, even a University education. This led many Non-conformist men to enter trade which with the onset of the industrial revolution, provided them with a power base. Non-conformists refused to pay the Church Rate, which was a tax collected by the Anglican Church for the administration of services within a parish, such as poor relief. The Non-conformists tended to be politically liberal (Whigs). Their campaigns were to separate state and church, abolition of slavery, reformation of the Corn Laws that maintained the high price of corn and therefore flour and the support of the New Poor Law. As soon as Byles settled in Bradford, he supported Milligan and Forbes attempts to get George Hadfield, a radical Liberal adopted as a candidate. Although Hadfied stood in 1835, he was defeated. Also, in 1835, Byles became a founder member of the Reform Club which confirmed the emergence of a determined brand of Liberalism brought to the fore by the new Nonconformist manufacturers. In 1841, the Reform Club merged with a more moderate working-class group called the Bradford Radical Association and became the Bradford United Reform Club. Although many of the aims were to promote working class demands, the offices were filled by middle class leaders from the Reform Club, including Byles who was the director. Byles importance was demonstrated by his appointment as one of Bradford’s Improvement Commissioners. The underlying reason for his appointment was to give him and other appointees a platform for push for a Charter of Incorporation. The Non-conformists ardently believed that if the town was run by a council, it would wrestle power from the Anglican Church. Also, it would permit for substantial improvements to be made to the town such as in sanitation, highways and housing. 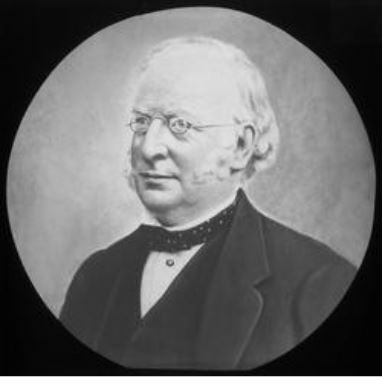 After a struggle, incorporation was achieved in 1848 with Robert Milligan as the first Mayor. Two years later, he was followed to that position, by Forbes. As such, Byles found himself in the centre of influence and as a result, he came into contact with the likes of Cobden, Bright and Colonel Perronet Thompson. Byles supported the latter as the new Liberal candidate for Bradford. Cobden offered to ”walk barefoot to Bradford to assist in returning the colonel” as Liberal candidate. After a bitter struggle by Byles to hold the Liberal party in Bradford together, Colonel Perronet was elected as the Liberal candidate. William Rand had tried to get lord Ashley elected as the Liberal candidate. Byles said of Rand, ” Mr Rand is a very good person, but not good enough as a politician to be allowed to pull the wires in Bradford and Mr Forster, whom I know very well, is totally sound and inexperienced as a politician”. After the Incorporation, Byles took less a part in the politics in Bradford. Despite his comments about Forster, in 1874, he had to make a decision whether to oppose or support his old friend. This was difficult as to support Forster was to go against his Liberal ideals. He decided to put party politics first and writing to his old friend, explained, “ my future whether longer or shorter must be where my past has been, and tho’ I shall have nothing to do with the irreconcilables at this election, I must not cut myself off from them by ever seeming to join with our ancient enemies – the Tories”. He did give Forster support in his paper with the unfortunate result that some of the radical Liberals tried to buy his newspaper from him and failing that, to start a rival newspaper. Although this turmoil died down, Byles was never wholly forgiven and this was reflected in speeches made during the 1884 jubilee celebrations for the Observer by the Kells, Illingworths and J V Godwin. As his political life waned, his life was still busy with family and commerce. Also, he was still a firm supporter of the Congregational church. He had joined Horton Lane Chapel in 1834. In later life he became a deacon and a trustee at this influential chapel. He lectured at the Mutual Improvement Society and, established the Horton Lane Book Society. He was also heavily involved in the Borough West Day School. Unlike many of his Liberal Colleagues he was willing to accept government aid for the school. Byles also supported the Bradford Town Mission and was on the management committee of the Mechanics Institute. It is said of Byles that he practiced a certain type of Liberalism which enabled him to influence without perhaps being wholly in the lime light and he was known for his pragmatism which enabled him not to be shackled by radicalism. William Pollard Byles, born in 1839, was the eldest son of William Byles and from an early age he was involved in the production of the Bradford Observer. His father took him into partnership in 1865. His views were perhaps more radical than his pragmatic father. He is said to have always put what was right for society ahead of what was right for either himself or the Observer. This did not always make him popular with his Liberal contemporaries. He championed the opening of the Free Library on a Sunday but was defeated. He championed the Irish Home Rule and attempted to set up a fund for Irish tenants, however, the cause lost support due to the actions of Parnell. He also championed the rights of the Manningham strikers to hold a public meeting in Dockers Square. Although he failed, the strikers ultimately won the right to meet at a designated site. Although he received little support from his Liberal contemporaries in his attempts to stand for election, he eventually represented Shipley for three years commencing 1892. Byles was a pacifist and actively opposed the Second Boer War (1899-1902). In 1900, he stood on an anti-war ticket as Labour candidate in Leeds East but was defeated. He returned to the House of Commons at the 1906 General Election as Liberal MP for Salford North. He was knighted in 1911. Byles retained his seat until his death. “But there is still one incorruptible below the government gangway. This is Sir William Pollard Byles. How this high-souled democrat was ever induced to accept a knighthood must continue to be a puzzle to all plain men, but happily this high titular honour has not strangled the man, and the Radical, and the House was greatly edified by an outbreak from him against the tyranny of the Treasury bench.” Yorkshire Post & Leeds Intelligencer 25 November 1911. He had a quiet personal life. In 1865 he married Sarah Anne Unwin in Colchester. Sarah Anne was the daughter of Stephen Unwin a wool stapler and merchant. They had no children of their own. Sarah A busied herself of the school board. While they lived in Bradford, they lived in Legrams Lane, then Selbourne Terrace, Manningham and later moving to Oakfield. They retired to Hampstead, London and had no other part in running the Bradford Observer. The Bradford Observer was renamed the Yorkshire Observer. William P died 17 October 1917 leaving his widow, £18,783 11s. 1d. Sarah died in 1931. There were many obituaries, however, one of the best can be found in the Manchester Evening Post. William P. had two full-blood brothers; Alfred Holden and Henry. Alfred was born in 1841 and chose a career in the church. In 1871 his is living in Headingley, Leeds and is recorded on the census as an Independent minister and Bachelor of Arts of the College of London. In 1865 he married Louisa Bridget Davids. They had six children: Roussel Davids, Winter Holden, William Esdaile, Laurence M, Hilda Margaret, Edith Mary and Helen Beuzeville. The family moved to Hanley near Stoke on Trent where Alfred continued with his calling. However, by 1900 the family had returned to Headingley. 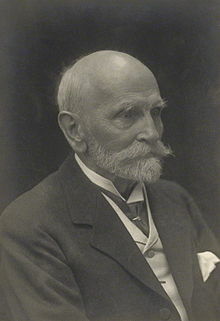 Alfred died on 22 December 1911 at his elder brother’s home in Hampstead. Two of Alfred’s sons, William and Winter emigrated to America where William started a rubber business. William fell in love with Katharine Russell of Brooklyn and asked his brother Rousell to officiate at their wedding. Rousell accepted and booked to travel on a White Star line liner to New York. Fatefully, he changed his ticket for one for the Titanic. Roussel David Byles was born on February 26, 1870 in Headingley, Leeds. He attended Balliol College, Oxford, where he was vice president of the debating society. Roussel decided to reject his Congregationalist upbringing and eventually became a Catholic, taking the name of Thomas. He taught at St. Edmund’s College, and Roman Catholic seminary, and published A School Commentary on 2nd Epistle of St. Paul to the Corinthians in 1897. 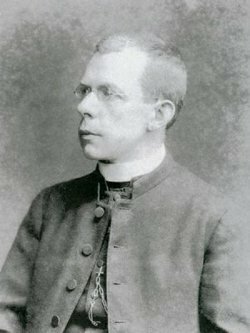 Father Thomas left St. Edmund’s in 1899 to study for the priesthood in Rome. He received a Bachelor of Divinity from Gregorian University in 1901 and was ordained on June 15, 1902. From 1905 to 1912, he was the Roman Catholic Rector of Ongar, Essex. His ticket on the Titanic was for a second-class berth and he comments in a letter dropped off before the ship headed off into the Atlantic that he was not fond of the sound and motion of the ship. He led the Catholic mass for second and third class, passengers on the morning of April 14, the day of the collision. By all accounts, Father Thomas was a hero until the end, helping women and children into lifeboats, hearing confessions and praying with passengers, and refusing a seat on the lifeboat that was offered to him. William E. Byles marriage to Katharine Russell went ahead but the wedding party changed back into mourning clothes following the service. His brothers installed a door in his memory at St Helen’s Catholic Church in Chipping Ongar, Essex. Pope Pius X later described Byles as a “martyr for the Church”. Father Thomas had three sisters. The eldest, Hilda Margaret (1879-1931) went to medical school and is shown in the register for dentists and later as recorded as a doctor. She took a post at the London Hospital in Hankow, China where she later became the Chief Medical Officer. She appears to have held this post from 1910 to 1930. She is buried in China. Edith Mary (1881-1969) married Arthur Stanway La Mare in 1904. Arthur was a teacher and when he died, probate showed that they lived in Gloucestershire. They had two daughters and one son, Bernard who became a lecturer in architecture in Scarborough. Helen Beuzeville (1883- 1969) went to medical school then became a teacher. In 1918 she married Rawlinson Ford and they settled in Bentham and had one daughter. The 1939 list had Rawlinson working as a managing director of a spinning mill. In their household was a family of three Austrian refugees, called Pollack. Born in 1843, the third son of William Byles, Henry grew up to study medicine. The 1871 has him practicing as a GP in Accrington. In 1869 he married Marian Jackson, a daughter of a music teacher from Masham. Henry continues to practice in Accrington. Between 1881 and 1990, He and Marian have three children: E. Marion R., Dennison B and William J. Sadly, in October 1990 Henry dies suddenly leaving a wife with a young family. At the time he is living at Moorfield House in Eccleshill, Bradford. The coroner’s report includes an account by his sister in law, Margaret Jackson who found him dead in the yard, near to the closet. She feels it necessary to report that his hat was off his head. The coroner who had held the inquest in the Wellington Arms in Harrogate Road, Eccleshill, concludes that he died of natural causes. One of the witnesses does comment that he often had a cough. Dennison B Byles (1882-1965) went to medical school. In 1839, he was living in Surrey and was the Deputy Director of the water examination board. His younger brother James Beuzeville Byles (1868-1940 ) became a surgeon. Mary Beauziville , his eldest child born in 1838 was sent away to school in Bishop’s Stortsford and in 1859 married William Maynard a wool buyer and set up home in Little Horton, Bradford. They had a son in 1860 called Lewis Holden. Two further sons were born to the couple, William Harold in 1863 and Alfred Kenyon in 1864. Sadly, Mary died in 1864 at about the time her youngest son was born. William Maynard later remarried. William H became a stuff merchant, married and had one daughter Gladys. When he died in 1945, he left over a £145,000. Lewis emigrated to Queensland Australia where he was involved in the Union Trustee Company Australia Company. He died in 1928. Alfred K married Mary Anna Byles in 1893. When Alfred died, he was living in London and left his widow over £23,000. He may have met his wife when he was living with his uncle W Peckover in Lawkland and Mary Anna Byles, listed as a High School teacher and Peckover’s sister, was also in residence. Alfred and Mary travel to America and Canada returning in 1895 with their daughter Frieda. Harriet never married but became a respected headmistress of the Bradford Girls High School. Anna, born in 1854 died in 1865. Ellen Margaret (1860-1934) married Charles Wade, Manufacturer and lived in Listerhills. She named her daughters after her dead sister Anna (Margaret) and had a son, Geoffrey Byles. Edith Jane Byles ( born 1862) married Arthur Binns a tax inspector in 1887. They settled in Harrogate but later moved to London via Warwickshire. They had four children: Frederick Maurice, James Brangwin, Doris Mary and Nora Breauziville. When Arthur died in 1952, he left over £27,000 to his children. He was a C.B.E. Their youngest son, James became a Congregational minister. Mary Anna Byles. (1875 – 1944) married her half-blood nephew, Alfred K Maynard, in New York in 1893. The couple return in 1895, however Mary appears on the 1900 census for New York, so clearly, they returned to New York. In 1944, when Mary dies, she is resident in London. Her executors are Geoffrey Byles Wade, retired manufacturer, and the Revd. James Brangwin Binns. She left over £27,000.